A new edition of the Tradecorp School, an event that gathers clients from the Middle East, North Africa, Turkey and South Africa, has been celebrated in Spain. In this event, clients visit Spain to receive training on agriculture in Spain on the field and the trips are completed with visits to the factories where they can learn more about Tradecorp products and production procedures. This year, 33 clients from Egypt, Sudan, Jordan, Saudi Arabia, Turkey, Lebanon and four VIP clients from Morocco have participated in Tradecorp School . 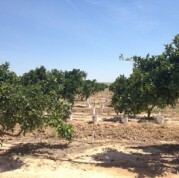 Participants in 2013 edition have had the opportunity of visiting and meeting Tradecorp clients in Spain, where they have shared their knowledge on how different crops are grown in Spain, such as table grapes and citrus. The 2013 Tradecorp School included also a visit to the biggest capsicums greenhouse in Europe and a visit to Tradecorp factory in Sanchidrián (Ávila), where most of Tradecorp solid products are manufactured, such as Ultraferro and Tradecorp AZ range. The participants were accompanied by Sameh Mostafa, Ihab Ibrahim, Mohamed Saad, Mostafa Hanafy, Abdellatif Hassnaoui and Mohamed Kaid, members in the MENA team, and by Laura Gómez, in behalf of Corporate and Technical Marketing department of Tradecorp – International Division.